Here's a bit of great news for you. Xbox Game Pass will now include access to all Xbox One exclusive games from Microsoft Studios as soon as they're released. The new era begins starting with Sea of Thieves on March 20 and extends to everything after that. Crackdown 3? State of Decay 2? 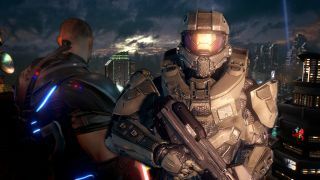 Yeah, but think bigger and broader; Microsoft also confirmed that the next games in its flagship Halo, Forza, and Gears of War franchises will be available day one on the subscription service. With that one announcement, Microsoft may have turned Xbox Game Pass into the best value in video gaming. Yeah, it's still an extra $9.99 a month / £7.99 a month if you want to keep your Xbox Live Gold subscription going too. But if you already buy at least two Xbox One exclusives a year and don't mind being unable to sell them back? Bang, worth your while. Also note that Microsoft does steadily cycle titles out of Game Pass. Once a given game leaves, you'll have to buy it independently to keep playing, even if you still have it downloaded. You will get advance notice and a discount however, and hopefully Microsoft won't be in a hurry to cycle out any of its big games. Bringing all Microsoft Studios (in other words, first party) games into the fold as soon as they're published brings Xbox Game Pass much closer to its potential as a Netflix-like service for games. After all, Netflix doesn't make you buy a Blu-ray or wait for months before letting customers stream exclusive series like Altered Carbon at no extra cost; it just gets added to the great big buffet line of streaming entertainment. The only thing keeping Xbox Game Pass from truly being the Netflix of Games now is that you still have to download and install them before you can play them, rather than streaming them instantly. If you're planning on signing up now that the Game Pass value proposition has gone way up, make sure you have a nice, big Xbox One external hard drive ready to store all those games.